It's a Stitchers Potpourri! 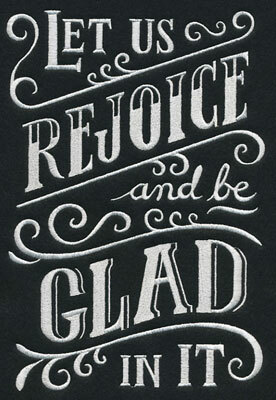 Dozens of new designs are available in a rich variety of subjects and styles. Your creative muse will adore these new designs. Fresh flowers are arranged in elegant cameos, and each flower's name is neatly written into the frame. 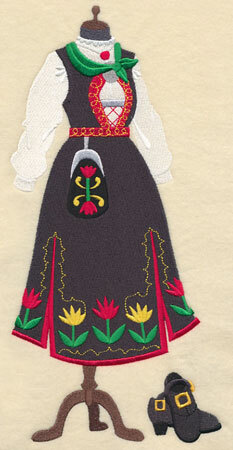 Travel around the world to find dress forms featuring traditional folk clothing from several different countries. 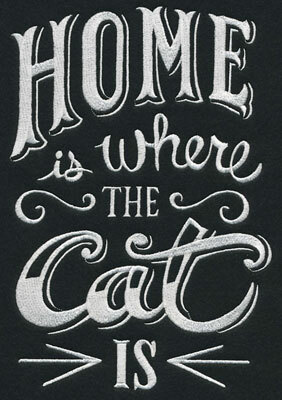 One-color chalkboard art is fast and fun to stitch on tote bags, pillows, and wall hangings. 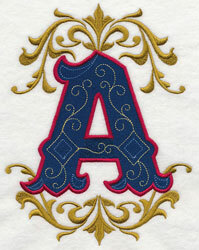 And, illuminated letters are brilliant for monogramming towels and totes. 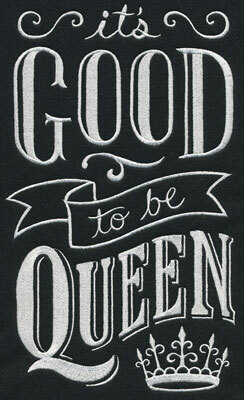 Scroll down the page to see the excellent variety in these new designs! 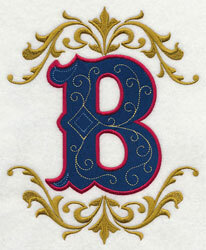 New illuminated letters add an elegant look to towels, pillow covers, and wall hangings. Click here for free project instructions! 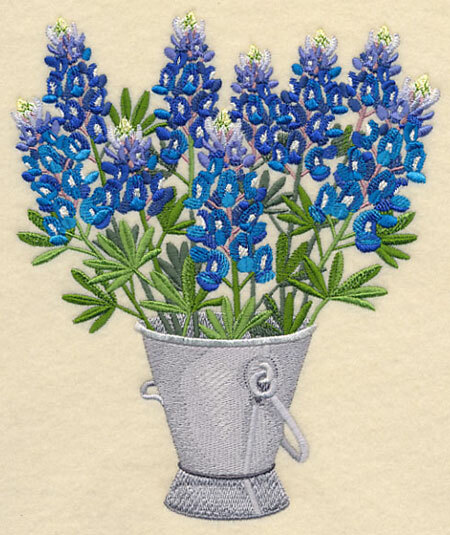 Bluebonnets are blooming in Texas! Don't pick them; instead, stitch them! 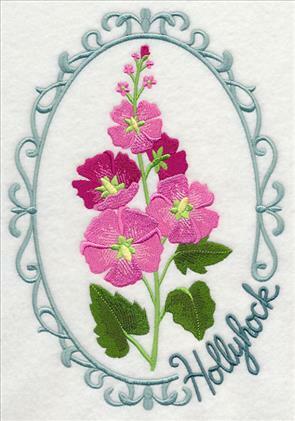 This design features a colorful bouquet of the popular wildflower arranged in a pail. 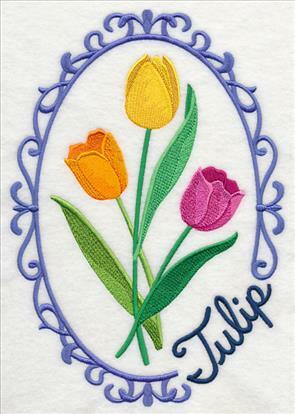 6.55" x 7.80" and 5.85" x 6.96" and 4.85" x 5.78"
Here in Minnesota we'll need to wait a little while longer to see tulips. 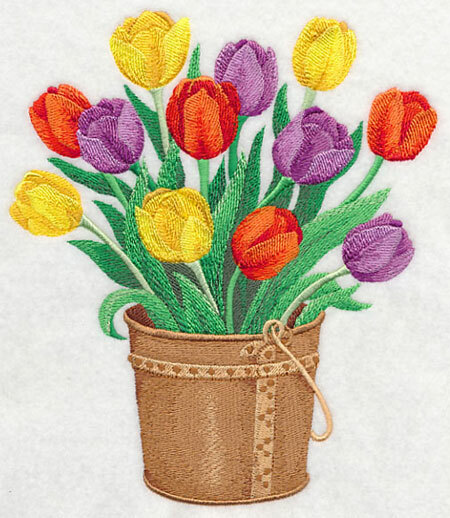 But in the meantime, we can stitch these colorful spring flowers, and enjoy the change of seasons. 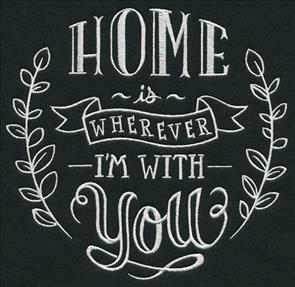 6.77" x 7.80" and 5.89" x 6.79" and 4.86" x 5.60"
One-color chalkboard art is a fun and fashionable way to stitch a message for a loved one. 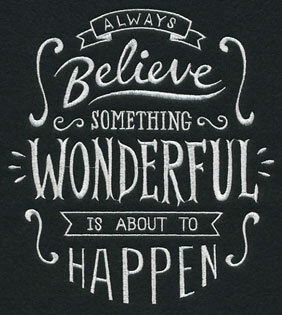 Below you'll find words and quotes that are uplifting, and sure to bring smiles. 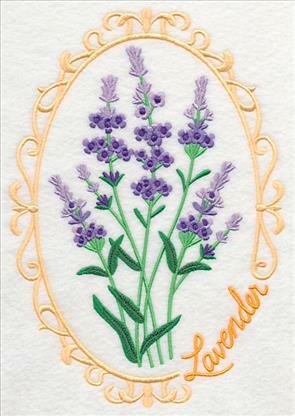 Add these quick-stitching designs to quilt blocks, tote bags, and pillows! 6.85" x 10.72" and 5.85" x 9.15"
5.01" x 7.83" and 4.39" x 6.86"
6.92" x 10.87" and 5.87" x 9.22"
4.98" x 7.81" and 4.37" x 6.85"
These designs are beautiful on tea towels and placemats. 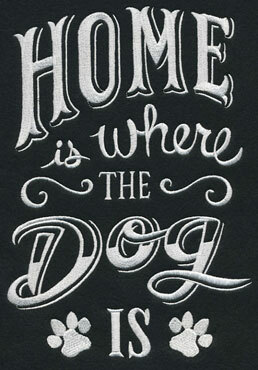 Greet every morning with positive and affirming messages on mug rugs and table linens. 7.83" x 7.51" and 7.15" x 6.85"
6.12" x 5.86" and 5.07" x 4.86"
6.85" x 9.80" and 5.48" x 7.83"
4.79" x 6.85" and 2.72" x 3.86"
A favorite Bible verse, divided into two designs. Stitch onto tea towels and display them side by side. 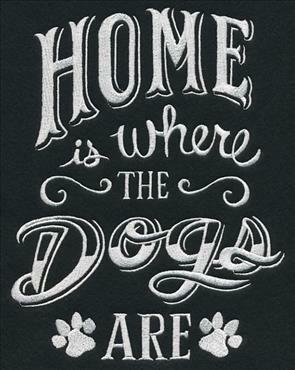 Add them to opposite ends of a table runner, and a pair of throw pillows, too. 6.59" x 9.89" and 5.22" x 7.83"
6.85" x 9.88" and 5.43" x 7.83"
4.75" x 6.84" and 2.69" x 3.87"
Stitch these designs onto quilter's cotton, linen, or twill. 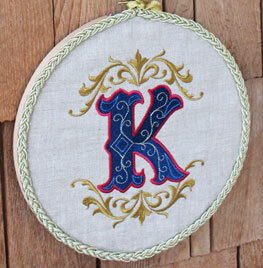 Frame them in traditional frames, or embroidery hoops! 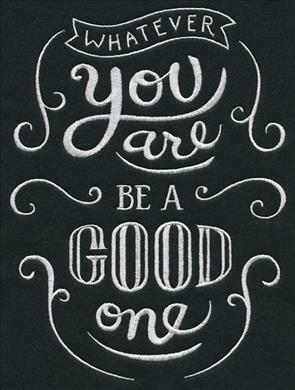 Hang them in your home as daily affirmations, and for a positive spirit. 6.85" x 7.54" and 5.85" x 6.44"
6.85" x 7.38" and 5.87" x 6.32"
4.87" x 5.24" and 3.58" x 3.86"
The "queen" design is fun on pillows and tote bags for birthday gifts. 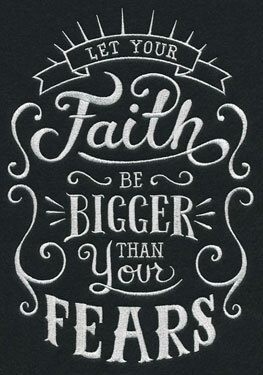 And, the quote on the right (attributed to Abraham Lincoln) is perfect on gifts for graduates. 6.92" x 11.54" and 5.65" x 9.41"
4.69" x 7.81" and 4.12" x 6.86"
6.85" x 9.21" and 5.82" x 7.83"
4.85" x 6.52" and 2.89" x 3.88"
Dog-lovers will delight in these designs! 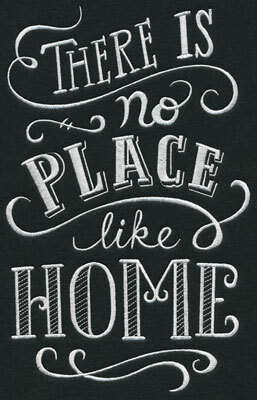 Add to framed pieces, wall hangings, and pillows. Call it classy canine couture! 6.91" x 9.83" and 5.50" x 7.81"
6.91" x 8.82" and 5.86" x 7.48"
4.86" x 6.21" and 3.02" x 3.86"
And, there are designs for the kitties, too. 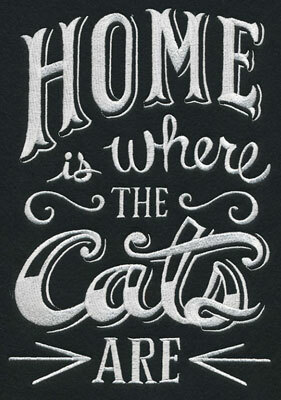 Cat-lovers will enjoy these one-color designs on blankets, pillows, and framed pieces for their homes. 6.91" x 9.96" and 5.42" x 7.81"
6.90" x 9.90" and 5.44" x 7.81"
4.78" x 6.86" and 2.68" x 3.86"
Travel around the world and explore fashionable, beautiful folk costumes. 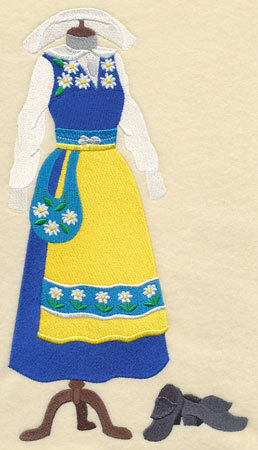 Below you'll find colorful dresses from Sweden and Norway. 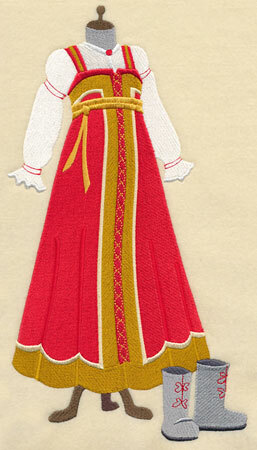 These dress forms are lovely as framed pieces, on tote bags, pillows, and more. 6.41" x 11.22" and 5.33" x 9.33"
5.63" x 11.26" and 4.68" x 9.37"
3.88" x 7.76" and 3.42" x 6.85"
A Dutch folk dress is paired with wooden shoes. 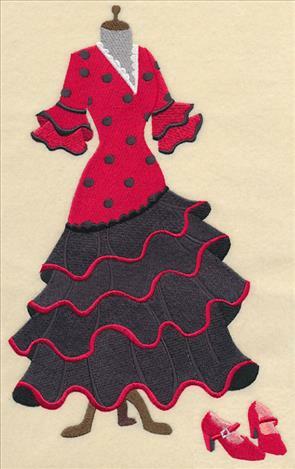 On the right, ruffles and layers of fabric add stunning effect to a Spanish flamenco dress. 6.70" x 11.31" and 5.57" x 9.40"
6.90" x 11.22" and 5.75" x 9.36"
4.77" x 7.76" and 4.21" x 6.85"
The Russian sarafan is a long, triangular shaped dress worn by peasant women in the 1800s. 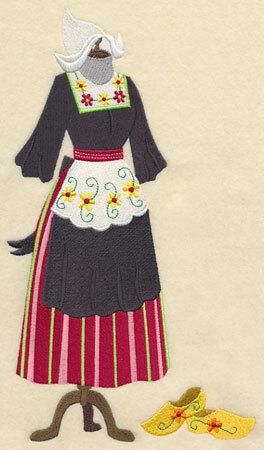 On the right is a German folk costume. 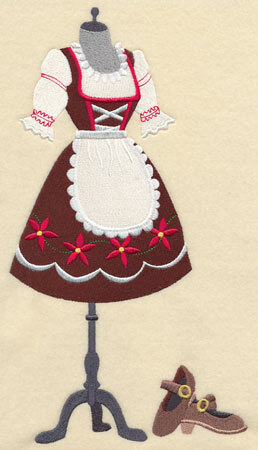 Dress up your cultural projects (or Oktoberfest wear) with these designs! 6.29" x 11.28" and 5.23" x 9.38"
6.23" x 11.21" and 5.18" x 9.33"
4.29" x 7.73" and 3.79" x 6.82"
Delicate and colorful flower sprays are framed in filigree frames. 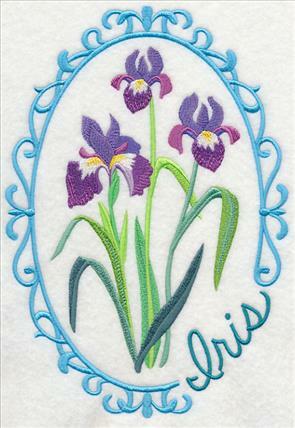 The flower names are written into the filigree, too! Delightful on quilt blocks, tea towel sets, and tote bags. 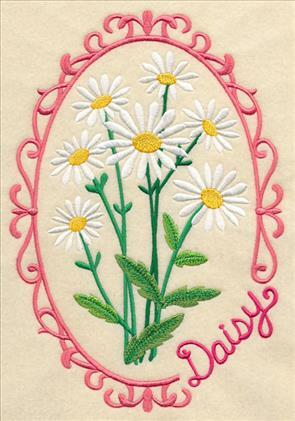 6.91" x 9.92" and 5.86" x 8.41"
5.43" x 7.78" and 4.78" x 6.85"
6.90" x 9.90" and 5.86" x 8.41"
Sweet daisies and dramatic hollyhock add a creative and colorful look to quilts, blankets, tea towels, and table linens. Plant these designs on both garments and home decor items. 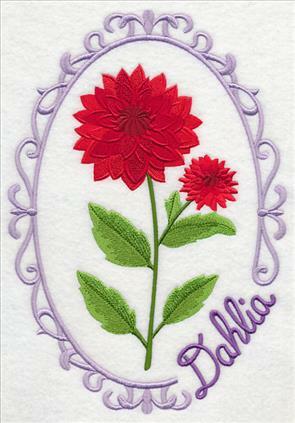 6.90" x 9.90" and 5.86" x 8.40"
5.43" x 7.78" and 4.81" x 6.89"
6.89" x 9.89" and 5.86" x 8.41"
A hearty dahlia bloom is framed in elegant filigree, with the flower's name written into the frame. On the right is a lavender design, a popular choice for scatter pillows and bath decor. 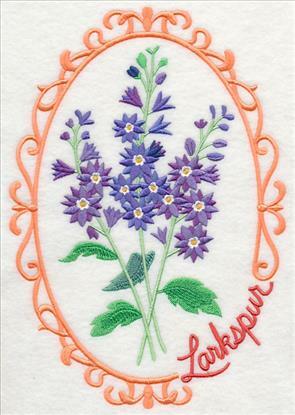 Dainty larkspur sprigs are encircled in an elegant frame. Add this colorful, cheerful design to quilt blocks, tea towels, tote bags, and more! 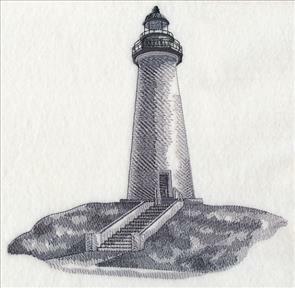 6.90" x 9.90" and 5.86" x 8.40" and 5.43" x 7.78" and 4.80" x 6.89" and 2.72" x 3.88"
Stitch the set onto quilt blocks, placemats, and tea towels! Pick your favorites by using the links above, or get all of the cameos in a design pack. **XXL - Designs smaller than 7" x 11.8"
**XL - Designs smaller than 6" x 10"
**Lg - Designs smaller than 7.9" x 7.9"
The illuminated words are popular designs, and each time we make a new word, we get dozens of requests for an alphabet. 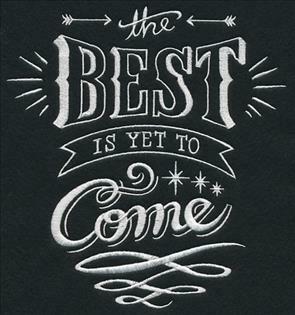 Your wish is our command, and we are happy to oblige! 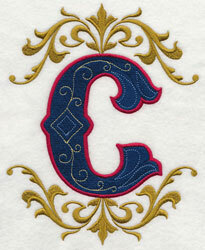 Illuminated letters are now available for your monogramming projects. 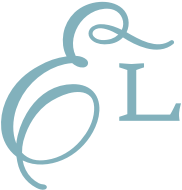 Letters, numbers, and ampersands are available in four sizes. 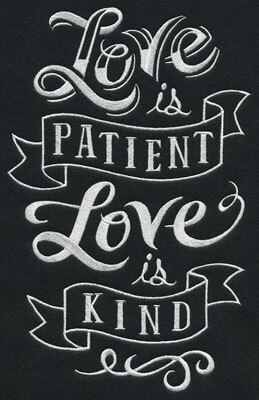 Add to pillow covers, totes, towel sets, wall hangings, and more! 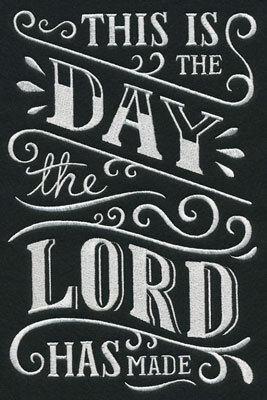 This lettering style will add a classic and timeless look to your projects. Add two pillows, wall hangings, towel sets, and more! 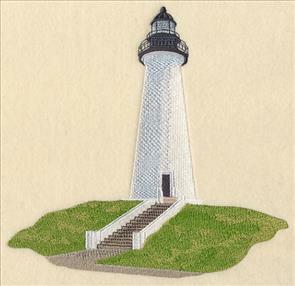 Dorothy loves the Port Isabel Lighthouse in Texas, and wrote to request a design featuring that majestic structure. We created two versions - a full-color one shown left, and a sketch-style on the right. Thank you, Dorothy, for the suggestion! 7.80" x 7.60" and 7.09" x 6.90"
7.79" x 7.61" and 7.08" x 6.90"
6.04" x 5.89" and 4.97" x 4.85"
To see other designs that have been created by request, click here.